One silver lining of the Village Voice canceling all new articles is that it gives me time to write for Deadspin again, and I did so yesterday, with an article investigating how exactly sports economist Andrew Zimbalist, once known as a prominent critic of stadium subsidies, ended up helping Worcester put together one of the biggest minor-league baseball subsidies ever to lure the Pawtucket Red Sox to town. He was able to reach this conclusion, he says, without any bookkeeping trickery: “I tried to at every turn be as straightforward and conservative as I could.” Even if the stadium itself is a money-loser like virtually all others in the past have been, he says his figures showed the city paying off its debts and even turning a small surplus, thanks to all the tax revenues that would pour in from the development alongside the stadium. Basically, Zimbalist says that he hasn’t changed his tune on stadium subsidies — he still thinks they’re almost always a waste of cash — but the extra development that was promised alongside the stadium should generate lots of tax revenue, so Worcester should come out even. And if that’s development that Worcester could have gotten without spending to build a stadium — which is Worcester-based economist Victor Matheson’s contention, and which would have allowed the city to keep the tax revenue instead of giving it to the PawSox owners — well, that’s not the question Zimbalist was hired to answer: He just had to say whether a new stadium would require new taxes, and he was able to make the math say “nope,” albeit by throwing in some speculation about housing economics similar to what he did with his first big consulting analysis, that of the Brooklyn Nets arena 14 years ago. But does that come across to the public, I ask? Or do people not attuned to the nuances of stadium economics just hear “no new taxes” and leave it at that, even if it’s siphoning off tax money that might otherwise be available for less sportsy purposes? Anyway, this article ended up being really long and taking a deep dive into not just the economics on ancillary development, but minor- vs. major-league stadium impacts and the ethics of serving as an economic consultant. You can read the whole thing here, and if all goes according to plan, keep an eye out for future articles by me on stadium (and other) topics at Deadspin. Worcester proposes $100m-plus in subsidies to steal PawSox from Rhode Island, now what? This entry was posted in Pawtucket Red Sox, Worcester Triple-A team by Neil deMause. Bookmark the permalink. I mean for $225 an hour, I suppose I could come up with some creative lies/omissions too. Oh wait I already do at times for half that! I hope he gets some pushback from his colleagues though. It is so frustrating people still fall for this crap. But elected officials are elected, not selected for there intelligence and good decision making. Who says you can’t teach an elephant to tap dance? So happy to hear Zimbalist is able to maintain his internal sense of professional ethics while constructing a justification that provides the cover his employer/contract client wanted and needed to push the stadium decision through based on a very selective reading of a document that was prepared specifically to exclude a significant portion of the economic impact it was supposed to analyze. Is this what passes for professional pride these days, I wonder? I agree on just one small point: Taxpayer subsidies are (generally) necessary for minor league sports as those businesses (for the most part) do not generate enough excess revenue to pay for the construction of the facilities necessary to house them. Some modest form of taxpayer subsidy tends to be an ‘enabling function’ for minor league sports. Of course, this is also a fine argument for not building such structures (they will literally never pay for themselves) and for business people to not purchase franchises that are not self supporting. 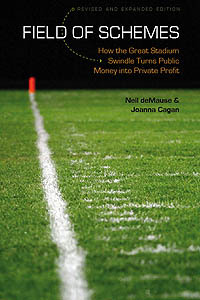 And nowhere in this ‘enabling financing’ discussion is it suggested that the team not be required to pay reasonable market rent, much less that they be allowed to keep all revenues from the facility with all operating costs and upkeep being covered by the taxpayer – shenanigans that happen all too often in today’s sporting landscape. The City of Worcester will own the facility. This has already attracted the WooSox, a commitment for another $100 M development for across the street, $35M from the state for infrastructure and road improvements, and stimulate interest in the areas real estate. Not as yet analysed is the economic “churn” of monies spent by the above for advertising, media, services, supplies and goods etc. In Massachusetts the Massachusetts Office of Tourism and Travel (MOTT) says that the average visitor will spend $85 and if that visitor stays overnight it’s $225. One cent of every dollar becomes revenue to the local municipality. For the predicted 450,000 baseball visitors to Worcester that’s $38,250,00 spent in the city and another $382,500 into the city coffers. Other city revenues will receive a boost such as Auto Excise Taxes, the Personal Property Tax, City Licensing and Permitting Fees, etc..
And with all do respect to Professor Matheson there was no imminent development on the horizon to develop the site. Has anyone ever said “With all due respect” and meant it? So many places to start, but how about this one: Where on earth are you getting 450,000 baseball visitors to Worcester? Is every single person at each game going to be from out of town? I find the argument puzzling that a vacant plot of land becomes Shangri-La just because a minor league ballpark is near it. Either Worcester is close enough to Boston to get this kind of development, or it isn’t a good development candidate. Let’s not overstate things. Minor League Teams aren’t independent competitive teams–they are the client of the Major League team. As an example–which two teams played in the IL Championship last year? Who won? The number of overnight stays is probably minimal, except for the truly, er, devoted. Allentown, PA offers a decent counterpoint. Built a hockey arena AND a baseball stadium. Lots of “ancillary” development with big dollars thrown around (“1 billion in investment”) with resulting taxes tagged for something else. In the indicators that matter–employment, fiscal health, the school system–things haven’t improved. But the boosters will say “but we had the AAA all star game”–imagine the publicity. Minor league sports are fun, and if you want to pay a few bucks to have it, so be it. Just don’t bother with the crazy economic predictions.